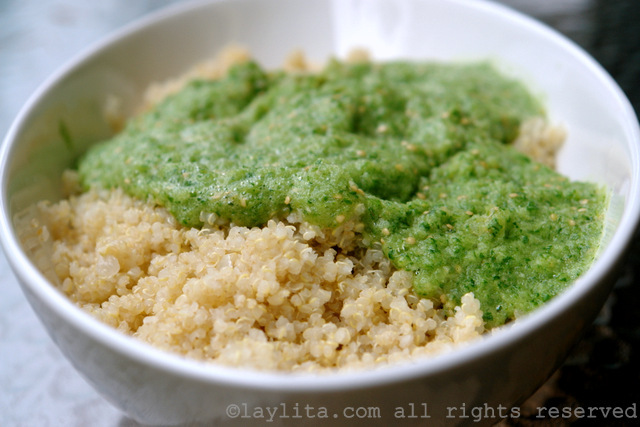 This refreshing and tangy quinoa with tomatillo and cilantro sauce is very easy and quick to prepare. This dish makes a great side dish for seafood, fish, and meat dishes. I originally prepared it to be served with pan seared salmon. 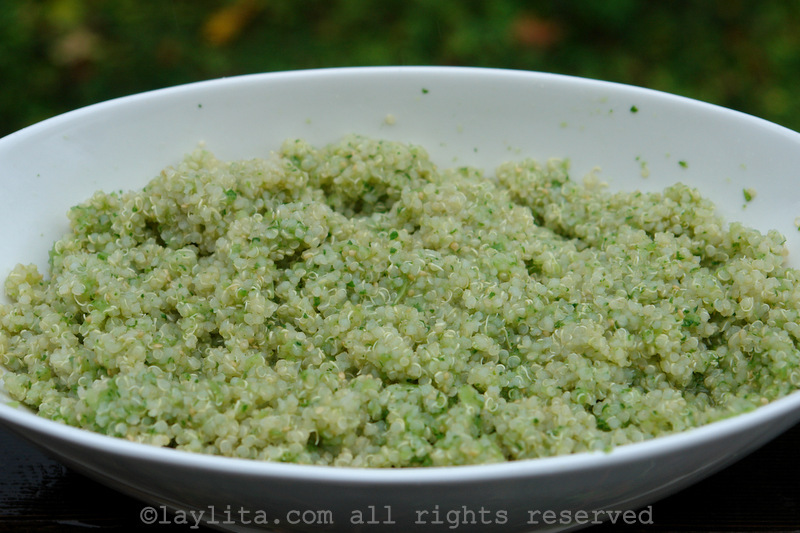 For this dish I prepared a quick sauce with tomatillos and cilantro and mixed it with the cooked quinoa. For a spicy variation you can add a jalapeño o hot pepper to the sauce mix. Like most people we usually eat a lot of rice and pastas. However, sometimes I just need something different and quinoa is a great alternative, it takes the same time to cook as rice, and is very nutritious. 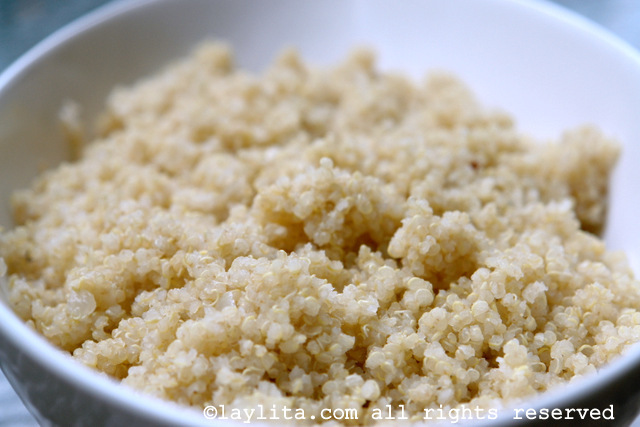 You can prepare a simple basic quinoa, but you can also mix it up different ingredients – just as you would with rice, couscous or pastas- to make it more interesting. Easy recipe for quinoa with tomatillo and cilantro sauce, this quinoa side dish is tangy and refreshing and can be served as a side dish for with seafood, fish, and meat dishes. 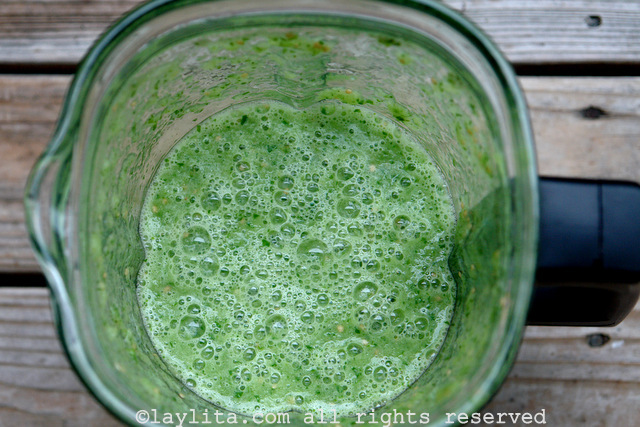 Combine the tomatillos, cilantro, lime juice, chopped onions, crushed garlic, hot pepper (if using), salt and pepper to taste in a blender, mix until a smooth sauce is obtained. Mix the sauce with the cooked quinoa, serve warm. Can also be made ahead and re-heated before serving. You can also serve as a cold side dish. 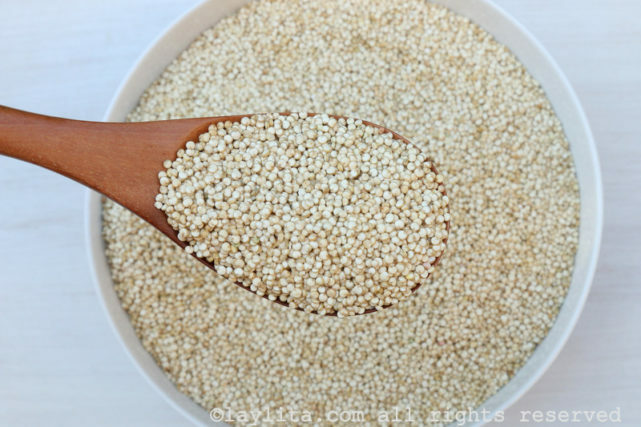 Quinoa is an edible seed, that can be cooked the same way as rice, it grows in the highlands of the Andes mountains and was an important staple for the Incas, who encouraged its cultivation all the way from what is present day northern Colombia to present day south of Chile. 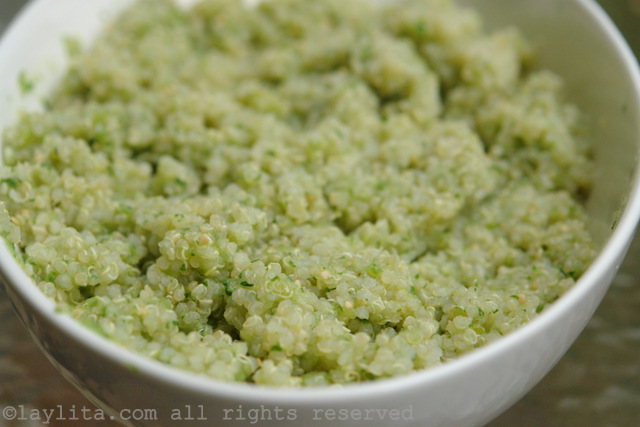 Quinoa is very versatile and can be used in soups, salads, desserts, etc. Tomatillos are tart fruits that look like small green tomatoes – sometimes with a hint of purple- , they are used mainly in Mexican dishes, and their most common use is for the salsa verde or green sauce that you get with chips at Mexican restaurants. I am very spoiled and lucky that most quinoa I buy at the grocery stores is already been pre-washed, so typically I just need to give it a quick rinse before I cook it. However growing up in Ecuador it wasn’t sold this way and I remember that we would have to sort through it to remove any dirt/small pebbles. We also had to soak it and rinse it several times until the water is clear, if not the quinoa would have a very bitter taste. I saw a meal plan from a local healthy food store and it had a Tomatillo-Ciliantro sauce, so I figured I could google it and make my own and WOW – This sounds like a great recipe … will be making it this weekend. This is a great dish. Everyone I’ve made it for loves it, and it’s very easy. Que rica esta receta, la quinua esta dando mucho que hablar, Don Lucho por favor si comparte sus recetas se lo agradecere infinitamente. Haciendo un pequeño cambio en la receta de laylita, Se me ocurre soasar la cebolla, los ajis y el ajo, para que no quede ese sabor de ajo. Probare y les cuento. Hola Laylita, muchas gracias por regalarnos estas hermosas y ricas recetas. 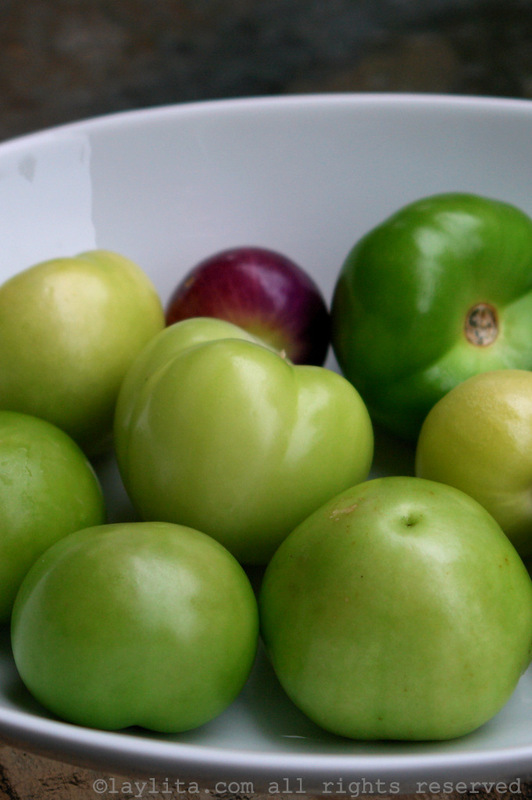 Soy de Quito, como sabes no tenemos tomatillo aquí, me puedes dar alguna sugerencia de con qué lo puedo reemplazar en esta receta?? ?, muchas gracias por tu ayuda. This looks yummy and I can’t wait to try it!